This cheesecake is the daddy of all desserts. I remember when I first made this decadent delight for two friends’ joint birthday. Since then there has been much tweaking and tasting of the recipe, hence the claim to be the best Baileys Cheesecake. The original recipe called for Tia Maria which is one of my big liqueur loves, but lately, I prefer to put my Baileys, or more to the point, Salted Caramel Baileys, to good use. Of course, if you’re a Tia Maria person, simply swap out the Baileys for the coffee liqueur. However, my tweaking and tinkering did not end there. I converted the recipe to the Thermomix and made the biscuit base a bit thicker purely for selfish reasons because the biscuity base is my favourite. I use granita (or plain Digestives) but if you want to champion the chocolate, chocolate digestives would work well too. 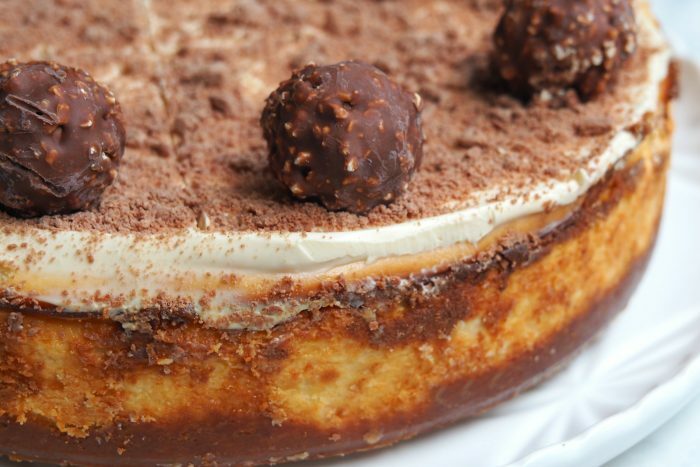 The cheesecake calls for almost 900g of cheese, which will please all the cheese lovers in the house! 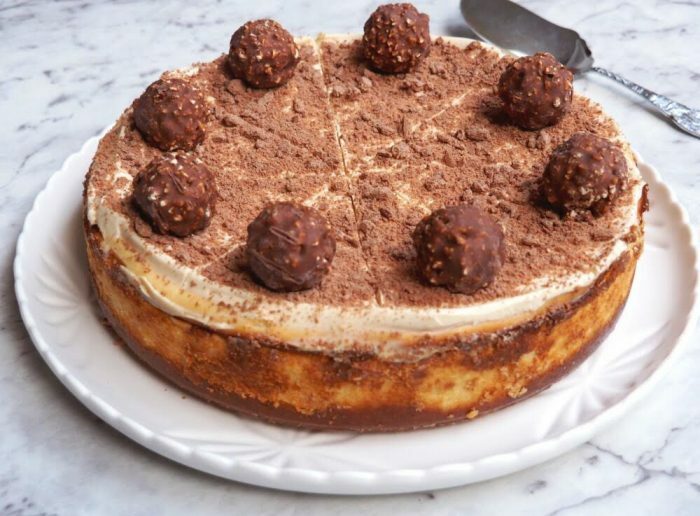 I like to mix and match using 3 blocks of cream cheese and then some ricotta, I feel it gives the cheesecake the anticipated richness but a featherlight texture. If your cheesecake does crack a little after chilling, don’t stress, because the topping is going to be slathered in sour cream anyway. Also, if like me, cake decorating isn’t your thingthe crumbled Flake will cover a multitude of decorating sins. For best results, don’t skip the cooling in the oven or the overnight chilling, you know what they say, all good things come to those who wait. 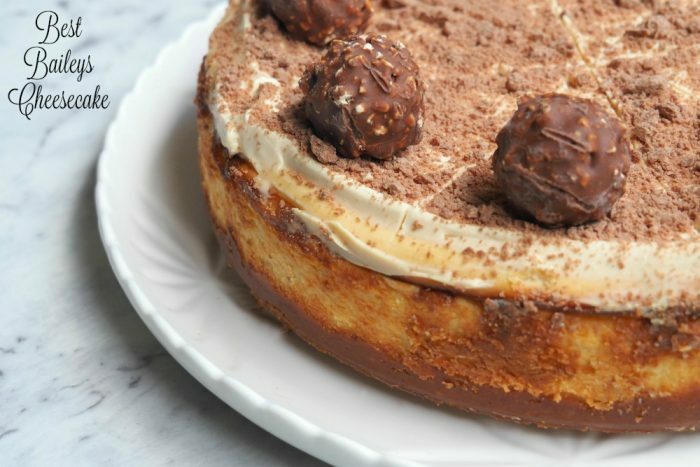 And this cheesecake is most certainly a good thing. When I knew my hairdresser, Heather was coming round for dinner, I knew I wanted to make this showstopper. I still hadn’t thought about main course, pfft, I’d worry about that later. Because dessert is always priority! So tell me, what’s your favourite liqueur? And when you have people over for dinner, what do you plan first, the main meal or the dessert?! Heat oven to 180C/fan 160C fan-forced. Line the base of a 23cm springform tin with baking paper and grease the sides. Melt the butter. Crush the biscuits and blend melted butter and biscuit crumbs. Tip the mixture into the springform tin. Press the biscuit butter mixture into the base of the tin. Use your hands or a spoon to do this. Bake for 10 minutes and cool. Increase the oven temperature to 240C/200C fan-forced. Beat the cheeses and sugar with an electric whisk until smooth, then add in the flour, vanilla, Baileys, eggs and 285ml sour cream. Pour cream cheese mixture over base and bake for 10 minutes, then turn oven down to 110C/90C fan-forced and bake for a further 25 minutes. Turn off the oven and allow the cheesecake to cool in the oven with the oven door slightly ajar for about 2 hours. To make the topping mix the sour cream (142ml) and Baileys, then smooth on top of the cheesecake. Chill. To serve, remove from the tin and slide onto a plate. 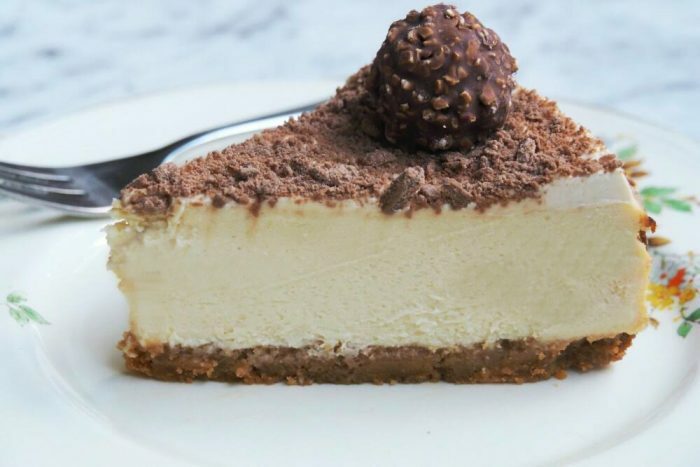 Sprinkle with crushed Flake, lightly mark the cheesecake into portions with a knife, then place a chocolate on every other portion. Melt butter for 3 minutes at 60C on speed 2. Check butter is completely melted. Add biscuits to TM bowl and crush for 5 seconds on speed 9. The mixture should have the texture of damp sand. If necessary, blitz for another 5 seconds. Tip the mixture into the springform tin. Press the biscuit butter mixture into the base of the tin. Use your hands or a spoon to do this.Bake for 10 minutes and cool. Increase the oven temperature to 240C/200C fan-forced. Wash and dry bowl. Add sugar, cream cheese, ricotta,vanilla, flour, sour cream and eggs to TM bowl and mix for 20 seconds on speed 4. Scrape down lid and sides of bowl and repeat, mixing for another 20 seconds on speed 4. Scrape down base and sides of bowl. Add the Baileys mix for a further 10 seconds on speed 5. Pour cream cheese mixture over base and bake for 10 minutes, then turn oven down to 110C/90C fan-forced and cook for a further 25 minutes. 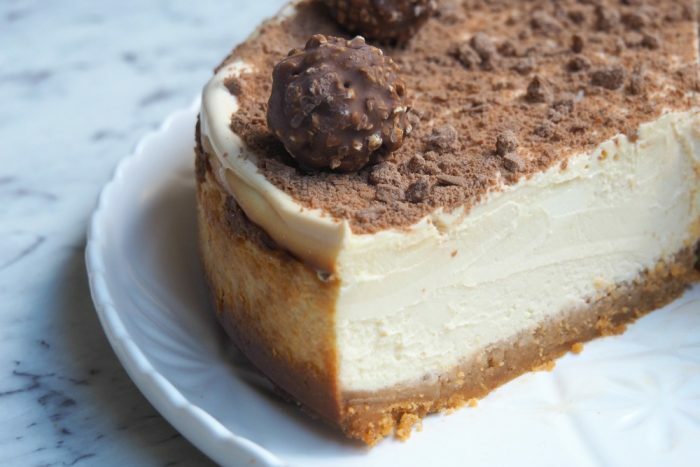 To make the topping, mix 142g sour cream with 3 tablespoons Baileys and smooth on top of the cheesecake. Chill. TO FREEZE Cover the tin, first with cling film, then foil and freeze for up to 6 weeks. Thaw in the fridge for 8 hours before serving.